The area around Southern California, and San Diego is beautiful. I love to hop in a car with my camera tools and wander around with a friend for a day trip, just looking at things. This specific day we stayed close to San Diego. The farthest we got out of San Diego was Descanso, where we had lunch at the Perkins Store. The Perkins Store is the largest thing I noticed in Descanso and it has been around for quite a while in our short American History. The Perkins Store, established in 1875. While I was walking around taking pictures of the general area, I headed back to my car, and someone had driven up to the store and left this dog just looking out the window. I thought he looked great. So, this picture is one of my favorites from my drive to Descanso. 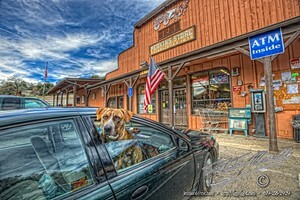 This entry was posted in Building Exteriors, Painterly, Pets - Dogs, Purchasable - As Art Prints. Bookmark the permalink.